Rowman & Littlefield. 2014. 300 pp. Summary for the Busy Executive: Pioneer labor. Between the two World Wars, one could argue quite strongly that neoclassicism became the dominant musical outlook. It touched almost every notable American composer: Copland (Short Symphony), Barber (Capricorn Concerto), Piston, Diamond, Creston (Partita), Bloch (Concerto Grosso #1), Irving Fine, Harold Shapero, Leonard Bernstein (Serenade), and so on. After the war, serialism supplanted it, at least up to the Seventies. Oddly enough, when one considers the movement's importance, this may well be the first book-length study of its American manifestations, more certainly the first such discussion aimed at the general reader. In this third book of series editor Walter Simmons's alternative music history of Modern classical music, Tobin tries to define neoclassicism and, quite rightly, gives up. After all, the Nineteenth Century had evoked classicism in its own way, with works like Peter Ilyich Tchaikovsky's Suite for Orchestra #4 "Mozartiana", Edvard Grieg's Aus Holbergs Zeit, and several works by Max Reger. The American neoclassicists differed too much in the actual sound of their music and in the degree to which they embraced the aesthetic to make a unified description likely. Tobin resorts to defining the aesthetic, whose main goals were structural and textural clarity and emotional restraint. He also gives a brief sketch of the rise and fall of neoclassicism. The former he traces to the influence of Stravinsky and, to a lesser extent, Hindemith as well as to the formidable pedagogue Nadia Boulanger, friend and supporter of Stravinsky, and teacher of many generations of American composers. Tobin ascribes the eclipse of neoclassicism mainly to the aggressive polemics of those on the serial side of things, which affected grant-giving organizations, academic hiring, and performing organizations' commissioning boards, although he also points to motives of individual composers who had become bored with the style or felt that it had played itself out in their own work. To flesh all this out, Tobin provides chapters on the following individuals: Edward Burlingame Hill, Walter Piston, Harold Shapero, Irving Fine, Arthur Berger, early Lukas Foss, Alexei Haieff, Ingolf Dahl, Louise Talma, John Lessard, Nikolai Lopatnikoff, and Aaron Rabushka – some names more known than others. 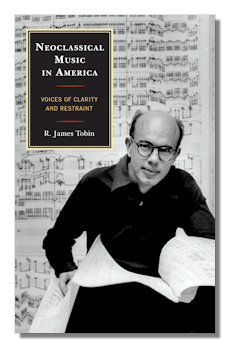 Following the general organization of previous books in the series, Tobin provides a biographical sketch of each composer, a critical compendium where possible, the author's assessment of the composer, and a description and critique of individual works. To avoid technical jargon, Tobin has provided listener's guides to the individual works. Whatever problems I have with the book come down to the listener's guides. I understand and sympathize with the desire to avoid musical type. A great music critic himself, George Bernard Shaw used to say something to the effect that printed quotation of actual notes was the last resort of a critic who couldn't write and, in most cases, superfluous. However, Tobin's descriptions sometimes make little sense if you haven't heard the relevant piece, but perfect sense if you have. He does best with the composers he knows best and for whom recordings have long been available – Piston and, outstandingly, Shapero. Indeed, Shapero hooked Tobin early and generated the longest chapter in the book. You can, like me, find some of the relevant pieces online at places like Spotify or perhaps in the collection of your local public library. That helps, as does the "Select Discography" Tobin provides at the back of the book. On the other hand, if you'd picked up a book on Chopin's music without having heard much Chopin, you'd be in the same pickle, and you probably wouldn't have as clear a description to digest as Tobin provides. However, I would have enjoyed some more tying in the individual pieces either to the composer's career or to the bigger American neoclassical picture. Furthermore (and I really nit-pick here), I fail to discover the organization of the descriptions. Sometimes they appear chronologically, sometimes within category type, sometimes in no discernable order. Anyway, it annoyed me a little. However, its virtues greatly outweigh its lacks. First, Tobin has listened to a whole lot of music – sometimes, where possible, in many different performances, including non-commercial recordings housed in libraries. He has read a ton of books, some of them classics (Wilfrid Mellers' Music in a New Found Land, for example) which he probably already knows, but the overwhelmingly most of them not. He also provides endnotes and a helpful index. Beyond that, he works to a clear thesis, with two really strong chapters – one at the beginning, and one at the end – setting out the book's thesis and then firming it up through recap. In addition, Tobin asks provocative questions about the worth of the movement and about artistic influence, among others. Knowing the bit of personal history he has revealed in his preface, I strongly suspect I know his answers and that they resemble mine. I myself love that period of American music and especially that artistic orientation in general. Outside of juvenilia, I can say I've never heard a piece by Stravinsky that didn't thrill me and that most of the composers Tobin deals with are among my favorites, as are the European practitioners of the style. Although I do like serialists, I confess I was unhappy to see neoclassicism's eclipse. The fact that recordings are difficult to come by seems to me a national shame. Walter Piston's and Harold Shapero's music should be in every self-respecting orchestra's repertoire. However, the serialists alone haven't kept this music from revival. Indeed, the serialists are today as unplayed as the neo-classicists. The fact that most orchestras struggle doesn't stem from the turf wars of the Fifties and Sixties. The causes are far more various, such as consumer choice enabled by technology and the decline of public and private music education. I could go on, but it would raise my blood pressure. Copyright © 2014 by Steve Schwartz.